Finishing in the qualifying positions of the top four of the Travel Plus Tours National League [TPTNL] was of course a means to an end – and now it’s down to the culmination of all that season-long effort for the Kent SLYDE Kings, with the first leg of their Play Off Semi-Final at Mildenhall Speedway on Friday evening. The battle between the table topping hosts and second-placed Kent sees the league’s top two going to head to head at the Fen Tigers’ famous West Row Stadium in Suffolk. Such as been Mildenhall’s success this term – also waiting for a Knock-out Cup Final against either Kent or Eastbourne and having already retained the division’s third competition, the National Trophy – the lack of remaining Sunday dates sees the track which opened in 1974 staging a Speedway meeting under the lights on a Friday night for only the third time in that long history. Whether it’ll be a TGI Friday moment for the hosts or for the visitors from the Garden of England it’ll be the perfect cure of Friday I’m in Love may hinge in no small measure on how both teams deal with key absences. Mildenhall have been hugely dominant all year – with a 100% record in all competitions at their West Row home. But the rigours of a long Speedway season have began to take its toll, losing two of their top three heat leaders to injury: former Kent favourite Danny Ayres out with a broken wrist and Josh Bailey suffering from the effects of concussion. Kent meanwhile also need to use a ‘Guest’ to cover at number one with Paul Hurry – hoping to get back on the comeback trail in time for the second leg on Monday – still out after suffering back, ribs and leg injuries. The ‘Guest’ facility is certainly getting some working out in recent weeks in the TPTNL and sometimes, goodness, it takes some working out! So it is on Friday, with the ‘Guest’ for Mildenhall at number one being one-time National League Pairs title winner (winning that in 2015 with the man he’s guesting for, Ayres; when both were Kent Kings), Ben Morley: last seen by the Kent faithful on Monday guesting in the Invicta race jacket against Eastbourne. And conversely, to cover for the missing Hurry, Kent team boss Chris Hunt has plumped for Eastbourne’s number one (seen in action against the SLYDE-sponsored Kings last Monday), Georgie Wood. There’s no question that Maidstone-based (like Hurry in terms of home town) Wood is in the form of his career and Kent will be hoping the much respected 25-year-old can bring his high scoring exploits of late to the play off table for his home county club. A locally based rider with much to prove is in Kent colours – Mildenhall domiciled Taylor Hampshire found his first meeting back from a leg injury of his own on Monday was a bit of a nightmare, failing to trouble the scorer for the first time in his Kings’ career. Hampshire is being given another chance after a nightmarish Monday to get back to his earlier season form and get his 2018 campaign back on track. Another recent injury victim really feeling it on Monday and like Hampshire, pointless is the diminutive, William O’Keefe. The 17-year-old from Suffolk is still suffering from a twice dislocated shoulder and so steps aside to allow Jamie Couzins to return into the reserve berths. Here he partners the most in-form man in the Kings’ ranks, Alex Spooner buzzing after two exceptional paid 15 points returns in his past two matches: for the British Young Lions and for Kent against Eastbourne on Monday. A former Mildenhall resident Nathan Stoneman was the Kings’ top scorer when they visited in the normal TPTNL match in July. 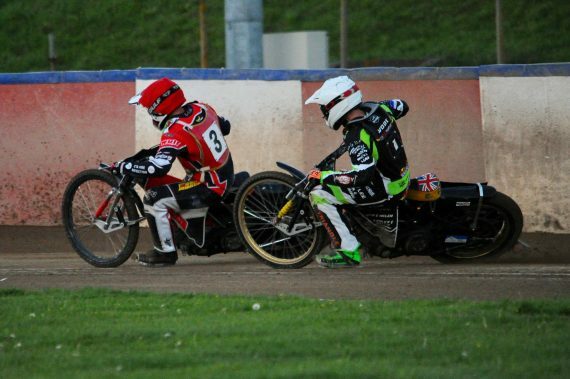 Mildenhall’s top man is 16-year-old Drew Kent – a maximum man home and away in the two sides’ meetings in the League. And sure to take additional rides to cover for the missing head injury-victim Bailey will be his skipper Jordan Jenkins and the hugely-improved Ryan Kinsley. The first leg will be a massive challenge for the Kings looking to build a solid total to take into the deciding leg at Central Park on Monday (1/10). This entry was posted	on Thursday, September 27th, 2018 at 9:00 am	and is filed under Featured, Other Sports, Speedway. You can follow any responses to this entry through the RSS 2.0 feed. Both comments and pings are currently closed.